We have come to the solstice and the midpoint of Ramadan, and as we move forward around the planning circle, we are moving out of the reflected teachings of Taoism-- and tolerance and empowerment-- and will start into the Christianity segment. The focus during the midpoint of the season is on doing what is in everyone's best interest, which is the solution to every dilemma. This understanding is what allows mankind to function on a higher level. To evolve. Islam addresses the Crisis in the Family segment of world peace, and for conflict resolution, the first requirement is that everyone is considered equal. As we pass the solstice, our focus starts to move toward the principles of solving the crises in the family by creating plan that benefits everyone. It is not up to Muslims to create any plan, but to stand in protest when someone is not standing on the principles of fairness and equality. To be treated fairly and equally is one of our inalienable rights granted to us by the Creator of us all. Coming up with a plan that benefits everyone is the role of Christianity. One example of a Muslim who came up with a plan that benefitted no one is Osama bin Laden's plan on September 11, 2001 to target the World Trade Center and the Pentagon. Acts of intolerance lead to of "waves" of crises that devolve into the seven crises that mankind face. 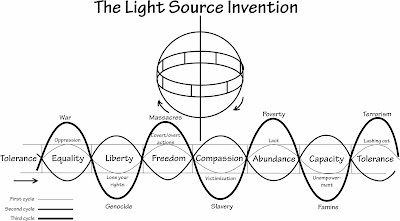 The Light Source Invention shows how there is an action and reaction that create villains and victims, and they go around in a circle, too, and as they do, they get worse. The Light Source Invention demonstrates the principles of "walking the straight and narrow." The power game that Muslims play is terrorism when denied a voice, and any plan that involves acts of revenge doesn't solve the crisis in the family, but puts Muslims into deeper into a crisis. Revenge involves five power games, including war, genocide, massacres based on the game of Greed, slavery and human rights violations and terrorism. With revenge, someone who plays the power game of Lust, which involves slavery and human rights violations, invites the terrorists into what appears to be a common goal. The common goal is to get revenge, and that is all the perpetrators will get out of the alliance or conspiracy because it is in no one's best interest for them to play the games. There is always a backlash to the games. Whether a plan is an act of revenge is something Muslims must discern. Does a plan involve doing what is in everyone's best interest? Does it treat all people fairly and equally? Was Osama bin Laden denied a voice in matters of grave concern and so he perpetrated acts of terrorism? Did he act alone or was he drawn into an act of revenge?